10 ATM Water Resistant: Daily Use Waterproof, Hand Wash, Shower, Swimming. 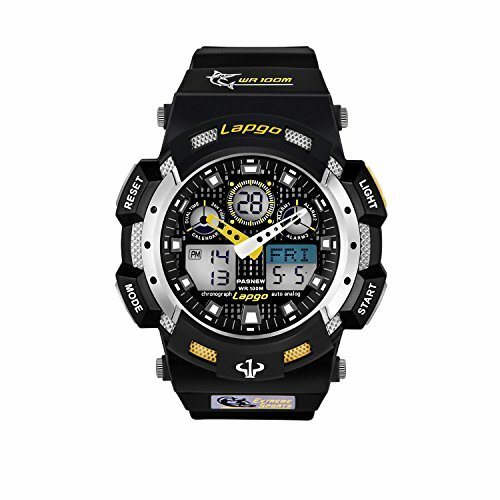 100M WATER RESISTANT & SHOCK RESISTANT: Perfect for both outdoor and indoor sports, such as running, climbing, fishing, swimming, diving and showering ect. MULTIFUNCTION WATCH: Daily Alarm, Month & Date Alarm, EL Backlight, Dual Timezone, Stopwatch, Alarm Clock , Calendar Function，LED Display, Shock Resistant. COMFORT & DURABLE: Soft Strap and Very Comfortable to Wear. Japanese Quartz Movement will serve for more than 3 years. Best Gift for children ,family and friends. EL BACK LIGHT: 13 Digits LED Display for time with easy read large numbers, show time clearly in the dark. WHAT YOU GET: Blueshadow Digital Watch x 1, Instruction Manual x 1, Watch Gift Box x 1, 30 Days Free Refund and 1 Year Warranty. Please DO NOT put it in hot water or press any button in water.